Almighty God, whose blessed Son dost guide our footsteps into the way of peace: Deliver us from paths of hatred and violence, that we, following the example of thy servant Moses, may serve thee with singleness of heart and attain to the tranquility of the world to come; through Jesus Christ our Lord, who liveth and reigneth with thee in the unity of the Holy Spirit, one God, now and for ever. Amen. Almighty God, whose blessed Son guides our footsteps in the way of peace: Deliver us from paths of hatred and violence, that we, following the example of your servant Moses, may serve you with singleness of heart and attain to the tranquility of the world to come; through Jesus Christ our Lord, who lives and reigns with you in the unity of the Holy Spirit, one God, now and for ever. Amen. 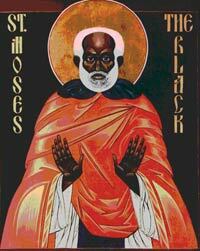 Saint Moses the Black (330 – 405), known as the Ethiopian or the strong, was a slave of a government official in Egypt who dismissed him for theft and suspected murder. He became the leader of a gang of bandits who roamed the Nile Valley spreading terror and violence. Attempting to hide from local authorities, he took shelter with some monks in a colony in the desert of Scetes, near Alexandria. The dedication of their lives, as well as their peace and contentment, influenced Moses deeply. He soon gave up his old way of life, became a Christian, was baptized and joined the monastic community at Scetes.